You start with the 21st century levels of luxury and service, but you’re transported back over a century by the graceful Victorian façade, the cool marbled lobby stretching off into the distance, the classic Islamic arches. The Old Cataract’s restaurants – one of them is actually called 1902 – also echo the elegance of an earlier, more stylish age. Step outside Old Cataract and you’ll find yourself in the world of the Pharaohs. You’ll be on the banks on the Nile. The Unfinished Obelisk is under a mile away. 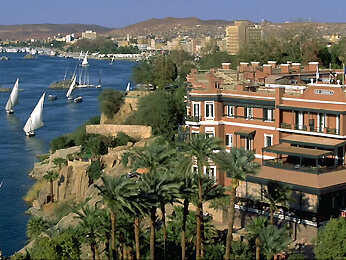 Elephantine Island, Philae Temple and the Tombs of Nobles are close to hand.